the instructor is the same one who teaches the course on campus, or is approved by the dean of the school or college offering the course and the dean of the Graduate School. 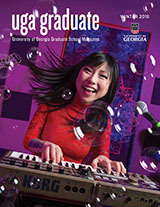 the requirement of two semesters of full-time work on campus in Athens (which need not be consecutive) is, in general, satisfied for all candidates for MA and MS degrees.An exception to the above may be made for students who prefer to spend one semester of full-time work abroad in a program of study approved by the University of Georgia or the Board of Regents. Such study shall be counted as resident credit; and the instructor is the same one who teaches the course or directs the research on campus, or is approved by the dean of the school or college offering the work and the dean of the Graduate School. Residence or non-residence credit for Studies Abroad is determined by the department from which a student is seeking a degree. Resident credit is considered any course for which registration takes place through the Athena system so that they appear on the student’s official transcript without a manual transfer process, which includes UGA online courses, and any courses taken under the cross-registration policy.